Name meaning: The street is named for James A. Forward. 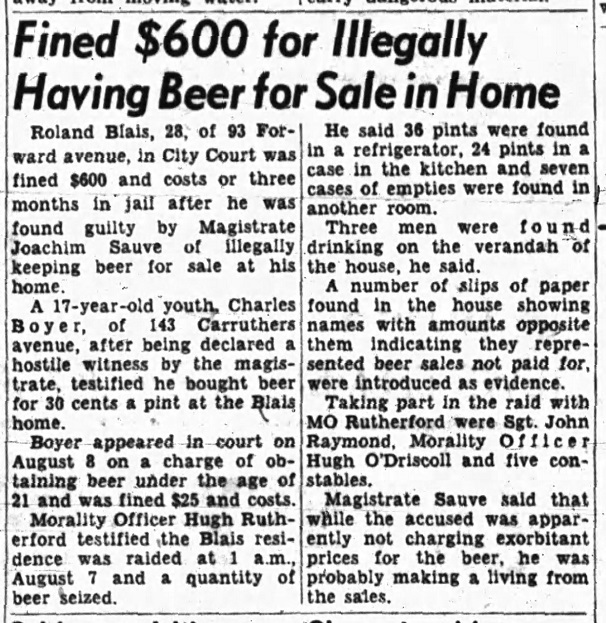 Born on a farm on the outskirts of Montreal at the east end of St. Catherine Street in 1869, he spent his young adult years in Lachute at a grist mill, where he learned the flour and feed business. 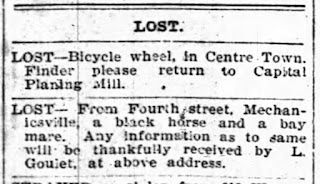 He opened a grain elevator at the northwest corner of Wellington and McCormick on Tuesday October 1st, 1895. 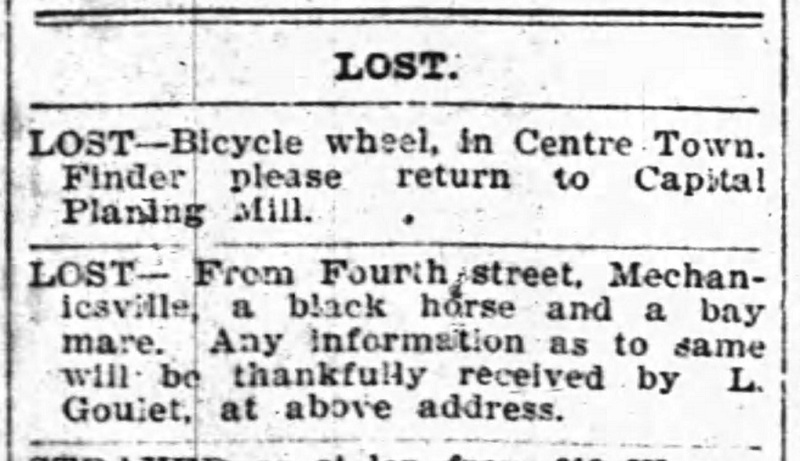 The mill had previously been operated by Alex McCormick, who had given Forward his first job in Ottawa in 1893. and where Forward worked and learned the trade over the following few years. Forward kept this flour and feed business going until 1942. At its peak it was handling 200,000 bushels of grain per year, and over $2,000 per month of Five Roses Flour. Forward was known as "Honest Jim" during his many years in business and politics. He first represented the public as a member of Hintonburg Council for five years. When Hintonburg joined Ottawa, he ran for Ottawa council in 1910, and was elected as Alderman. 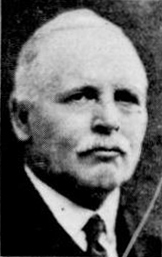 He served Dalhousie and later the new Elmdale ward for over 26 years until 1938 (only taking a break in 1914-15), when he was appointed controller by City Council. He was later elected to the Board of Control for 1940 until the end of 1942 According to an Ottawa Citizen article, Forward was known as "Honest Jim" to "thousands of residents of the Capital who loved and respected him for his high business principles and unimpeachable integrity in municipal affairs...When he took a stand in City Council no one could sway him from his conviction of what was right and proper. He took no middle course but followed the line of action dictated by his concept of duty and his understanding of the immediate problem. It is not being trite to say that no other may in council was more highly esteemed by his colleagues for his unfailing common sense, A man of simple tastes, he many a time had driven to committee meetings in his truck, and received the good-humored chaff of his fellow members as he walked into the room wit his clothes still dusty with flour." The Journal added that "Mr. Forward was one of those fine, decent, dependable citizens who are the backbone of a community. He gave lavishly of his time to civic affairs, gave close study to civic problems, and brought to bear upon them not intuition, not a flashing mind, but the weight of a plain man's common sense, and common sense served well both him and the city." 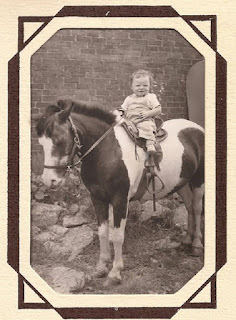 Forward and his wife celebrated their 50th Anniversary in April of 1941, and he passed away Monday January 25th, 1943. Funeral services took place from his home at 425 Parkdale Avenue (or now better known as Abbeyfield House) next to Parkdale United Church. How named: The streets of Mechanicsville originally all had numbered streets. 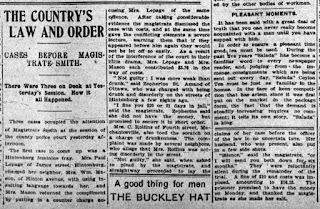 When Mechanicsville was annexed to the City of Ottawa in 1911, it obviously created duplicate street names. The Board of Control for Ottawa was asked to come up with new names for these duplicate streets. So, on June 27th, 1911 at a meeting of the Board of Control, Fourth Street was renamed to Forward Avenue to honour James A. Forward for all contributions to the west end in politics and business. 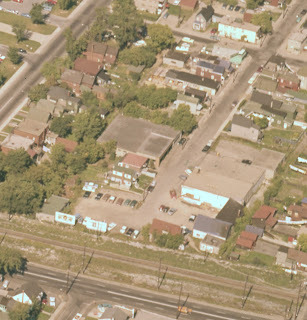 It's interesting to note that Forward Avenue was not renamed to match its Hintonburg counterpart on the opposite side of Scott Street and the CPR tracks. as others were (like Hinchey and Carruthers). The reason for this is that Forward was never a through street. There was never a crossing over the CPR tracks, like there was for Parkdale, Hinchey and Carruthers. So to minimize confusion and highlight the lack of a crossing, Fourth Street was given a new name, and not simply renamed Pinehurst, though I'm sure consideration was given to the matter. Forward Avenue is a particularly interesting street to profile, because so many of the original houses are gone. 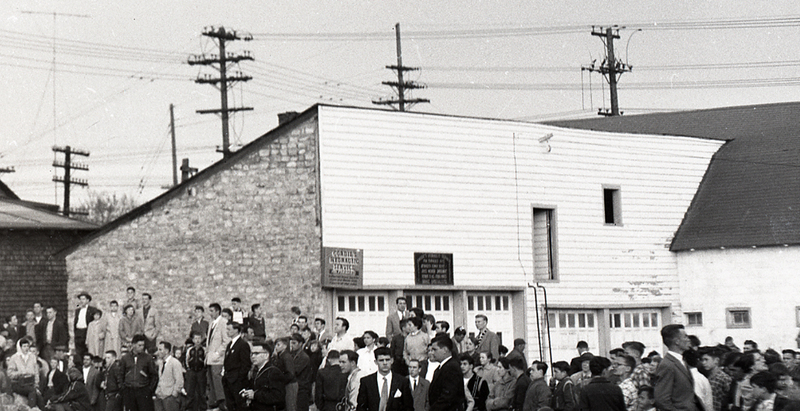 At its peak in the early 50s, there were approximately 71 houses on the street (including a couple of businesses). Of those 71, only 20 remain. So while all of the streets in Mechanicsville and Hintonburg have been affected be redevelopment, none has been harder hit than Forward. Forward Avenue was first laid out in the original Mechanicsville plan. The plan was filed in July of 1872 by Blasdell and Baldwin, who operated lumber mills near the Chaudiere, and who looked to establish a residential area for their workers. In 1872 there were only a few farming homesteads west of Bayswater, and it was just the thin, rocky Richmond Road that ran to the west. The Canada Central Railway had just opened their line from Lebreton to Carleton Place in 1870, and so this small area between the rail line and the river was chosen by Blasdell and Baldwin as an ideal spot for their small subdivision. It also helped that the land was available cheap from the Nicholas Sparks estate. Lot sales in the new "Mechanicsville" section began in that summer of 1872. Forward Avenue on the original plan extended only to the north as far as Burnside (then called Pine Street). Blasdell and Baldwin curiously though filed a new Plan 41 just four months later in November of 1872. extending Fifth (Parkdale), Fourth (Forward) and Third (Hinchey) an extra block to the north to Spruce Street (Emmerson), but yet no further than that. I can only guess that there may have been more of a demand from land buyers for lots closer to the River. Certainly evidence shows this northern portion became built up much quicker. Proximity to the River being more important at the time than proximity to Richmond Road. Based on available sources, it can be determined that the first two houses built on what is now Forward Avenue were constructed within the first few months of the Mechanicsville subdivision being established. One of these houses even still exists today, a true original Mechanicsville home! The house at 134 Forward Avenue impressively has stood on this spot for 144 years. It's a small little wood-frame house, with two short additions added over time, but it has somehow survived from the beginning, and it may well be the oldest house in Mechanicsville. It was constructed in 1872 by a fairly prominent Ottawa contractor Richard Abbott, who four years earlier had worked closely on the construction of the first dam at the Chaudiere falls. The first occupant was 30-year old Thomas Chess (little other biographical information can be found on Chess), but soon after became the long-time home of Gilbert Dinnelle and his family, and later Daniel and Mary Lahey. It is certainly significant that this house still stands! The other house built between 1872 and 1873 was #148 Forward, a home that was originally just 1 1/2 storeys and 3 rooms, built by 65-year old Irishman Samuel Cook. 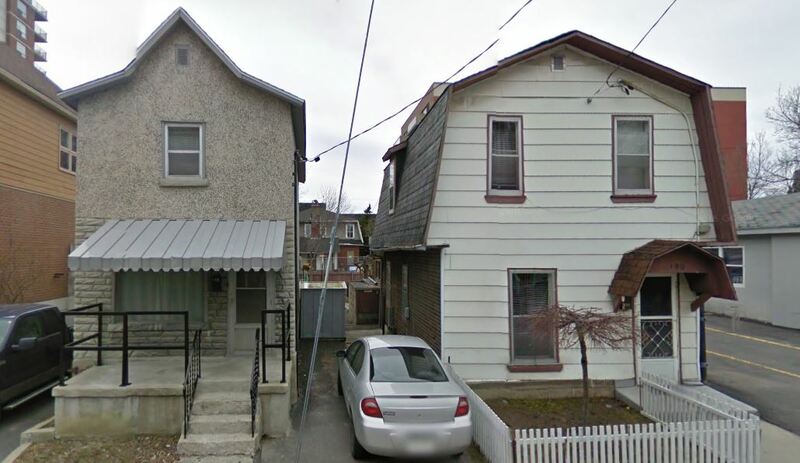 This house was later renovated to 2 1/2 storeys, and survived until the early 1960s. 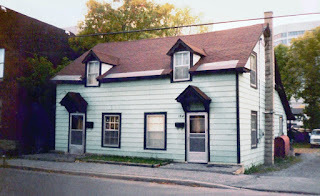 On a personal note, this was also the home where my grandfather Ted Sauve was born in 1927! The Sauves resided there for a short period in the late 20s and early 30s. 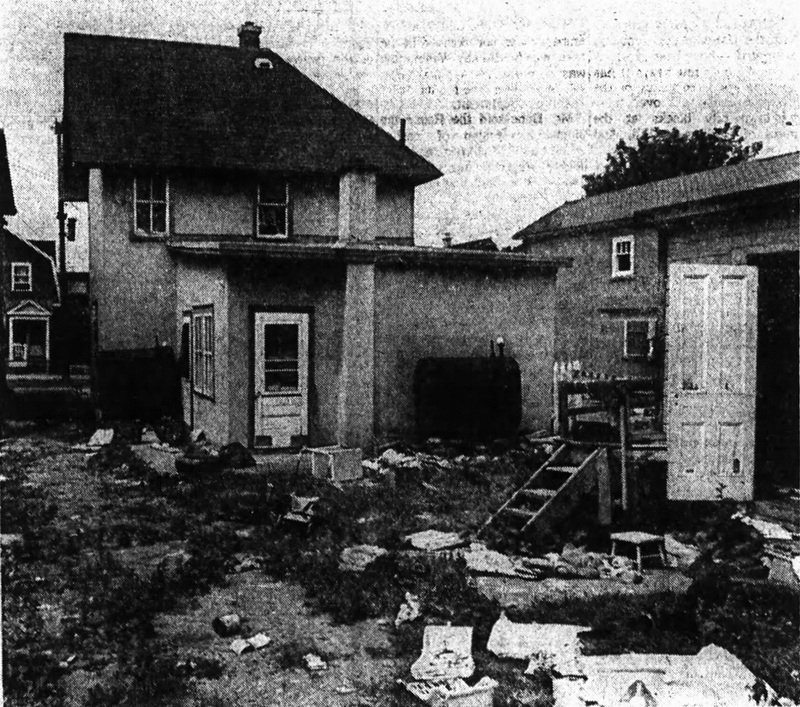 Since it was always a pretty roughly constructed house, when the City was embarking on their "urban renewal" project in the late 1950s, it was photographed from front and back before being demolished. The next two houses built on Forward were at the north end of the street by the corner of Emmerson. 70 Forward was a thin, 1 1/2-storey wood-frame house built by Donald McLean between 1873-1874, and first occupied by 57-year old labourer John Cummins. It survived until the 1980s, when the north end of the block was demolished to make way for the Island View apartment building at 44 Emmerson. 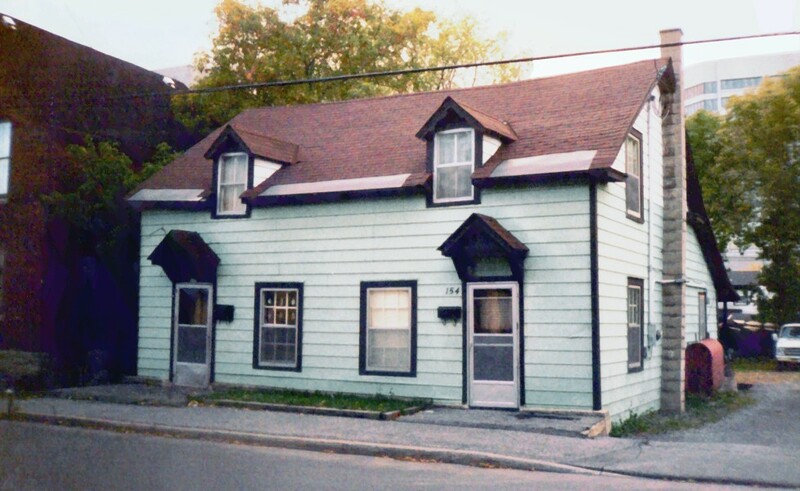 No new houses were built until three years later, when a tiny, square-shaped 1 1/2-storey wood-framed duplex was constructed in 1877 by 24-year old Baptiste Lafleur. This house was located on the east side of Forward, fronting on to Emmerson (#40/42 Emmerson). Of course, this whole area of Forward and Emmerson doesn't even exist anymore, it's just a fenced-off grassy field owned by the NCC. This portion was part of the Parkway expropriation in the late 1950s, so by the early 60s, all of the houses were demolished in order for the NCC to have a, well, fenced-off grassy field. Kind of senseless, in retrospect. 1877 also saw the construction of 99 Forward, a long, wood two-storey house. 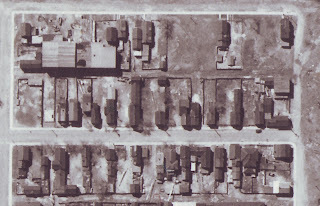 It along with the rest of the houses on the east side of Forward north of Burnside were demolished in the early 1970s to make way for the Riverton Park apartments complex. Between 1879-1880, a house was constructed at 190 Forward near Scott Street by well-known butcher Joseph F. Hanrahan, but it was lost to fire by 1883. A new house on this lot was built 20 years later, a small one-storey home that was enlarged around WWI to 2-storeys, as it remained until it was demolished around 2010, along with the cool home next door at 192 (which was built just after 1910). This property has sat as a parking lot for several years. Unfortunately, most of the original swath of Forward Avenue houses have disappeared. The earliest houses have been lost for a variety of reasons. The primary reason is simply that most were likely no better than a shack or shed. They were all of wood construction, often just one storey, sometimes comprised of just two rooms (that's not bedrooms, that's rooms total). The houses were built by workers at the mills, improved gradually as they could afford it. Of course there were no sewers, no electricity and no water at this time, so truly these houses were little more than sheds. By 1886, there was a total of 15 houses on the street (development was fairly slow until the 1890s with a slow economy), and of those original 15, only the one shown above (#134) still remains. By 1891, there were 25 houses on the street, of which just two remain, #134, and the next-oldest house that still remains on the street, 133 Forward Avenue. #133 was built between 1889-90 by Thomas Coakley, a 39-year old general labourer, who had just immigrated from England with his wife and six children. second-oldest remaining house on Forward Avenue. This house below, a duplex at 154-156 Forward was built around 1885 by James Newton. It remained until the mid-1990s when it was demolished to make way for the large group of townhouses at the south end of Forward. a regular basis dating back to the late 1980s). There have been a few businesses which have existed on Forward, some of the quite notable in the history of Mechanicsville. Between 1901 and 1902, the first business opened on Forward Avenue (then still Fourth Street). Adelard Bisson opened a grocery store at the south-east corner of Pine (Burnside) in what was 123 Forward/56 Burnside (this building was torn down in the 1980s to make way for the apartments at 50 Burnside) . Bisson was a 36-year old former cab driver. 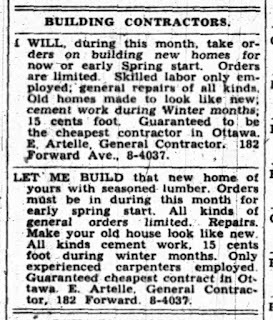 Business must have been good in the early days, as in 1907, he had the house bricked, only the second house bricked on Forward Avenue. In 1908, a second business was opened, a grocery store was opened on the opposite corner (the south-west corner of Pine) by Alexandre Latreille in what is now 122-124 Forward & 64 Burnside. Latreille had it bricked in 1909. This store by the mid-1920's became better known as the River View Hotel when it was purchased by Nelson Gibeault. As the River View Hotel, it had a small bar-tavern on the main floor, and the upstairs was rented out as rooms. 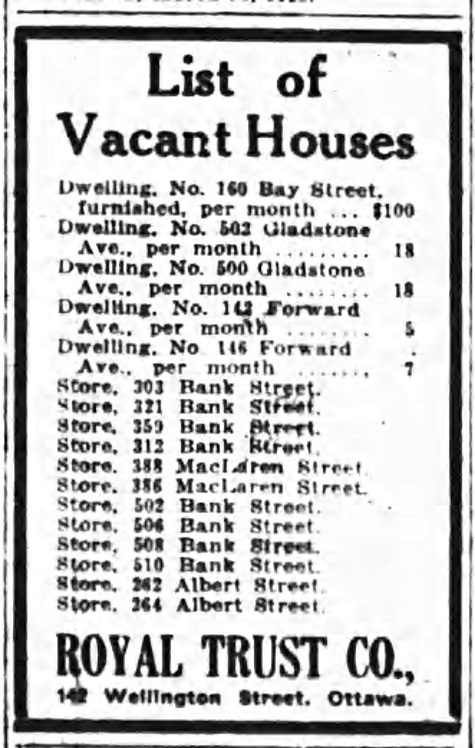 Gibeault, who had been operating a grocery store at 109 Forward after WWI, ran the hotel at the corner of Burnside until 1942, then focused back on running a grocery business at 64 Burnside until 1956. He died in 1959. The former River View Hotel, 122-124 Forward in May 2016. 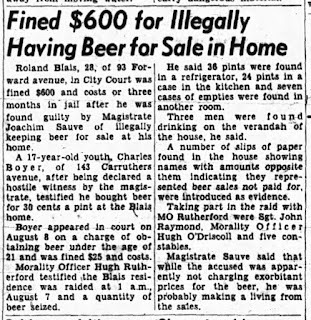 Lucky for Gibeault, both charges were dismissed the following Monday, when Constable Oscar Charbonneau testified that though he found 18-year old William Dunn drinking beer at the hotel, he was unable to offer proof of Dunn's age, so the case was dismissed. 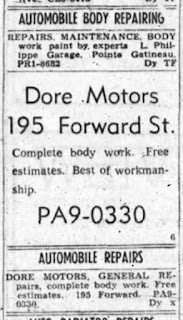 Of course an article on the history of Forward Avenue must include the story of the Artelle family, and their ice-selling business. The earliest the Artelles can be traced to Forward is the year 1900. 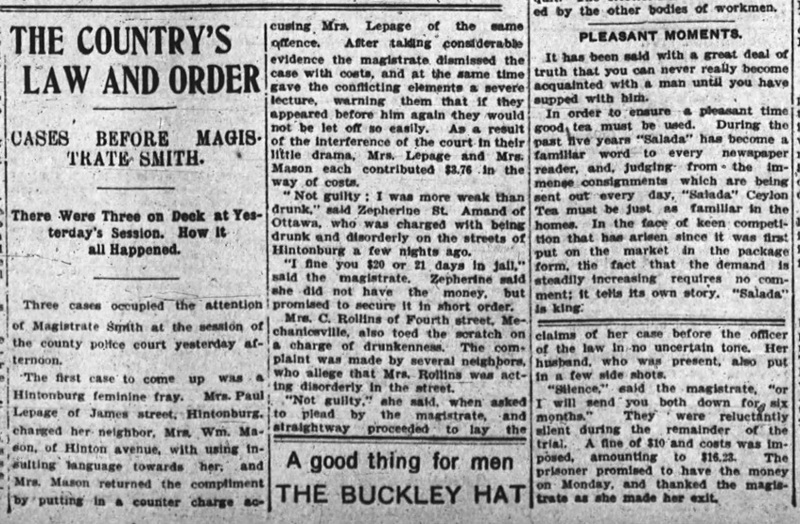 Alfred married his first wife Georgina on July 26th, 1898, at Billings Bridge. 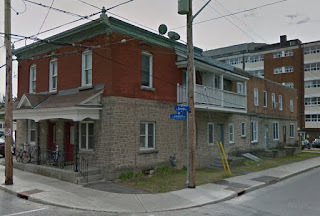 Their whereabouts are unknown until early 1900, when Alfred and Georgina were listed as residing in a rented home at 178 Forward (and Alfred's widowed mother Sarah resided around the corner at 65 Lyndale). It appears that it was during the year of 1900, while residing in the rented quarters next door, Alfred built 174 Forward Avenue at the south-west corner of Lyndale for his now growing family to reside in (his first two children Alfred Jr. and Albert were born in 1899 and 1900 respectively. Interestingly, the family name appears as "D'Artelle" in most records prior to 1902, then switches to "Artelle" after this. The deed of sale in the land registry even spells it "de Hastell". 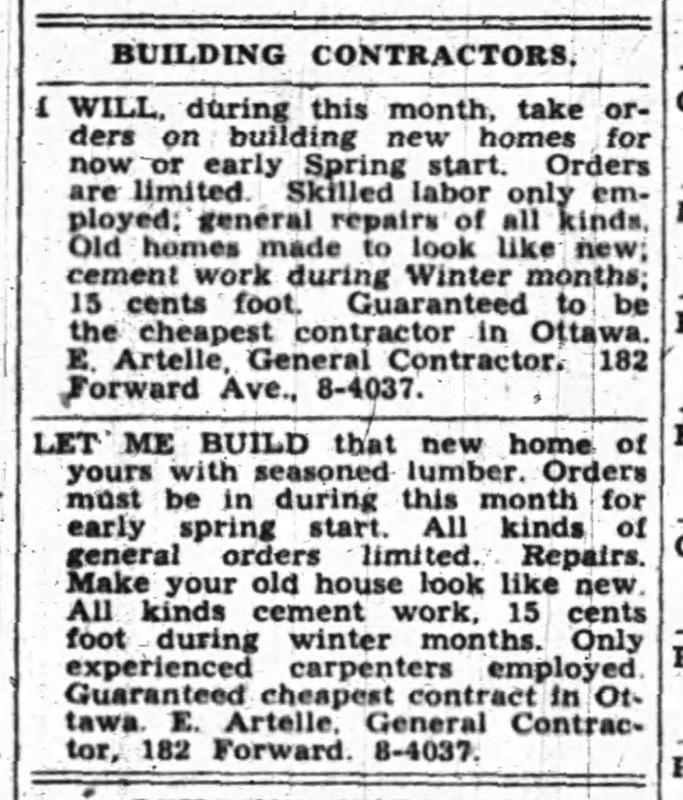 It is possible Artelle dabbled in ice-selling prior to that, as on the 1912 fire insurance plan, there is a series of various sheds and outbuildings on the property at Forward and Lyndale, a total of six in various sizes, including two connected at the rear of the house and along the back property of 2-storeys in height. Starting in 1917, Artelle began acquiring vacant lots at the south end of Forward Avenue, and constructed large ice houses. His ice houses show up on lots 17 and 18 on the east side of the street by January 1922 (see the image below). 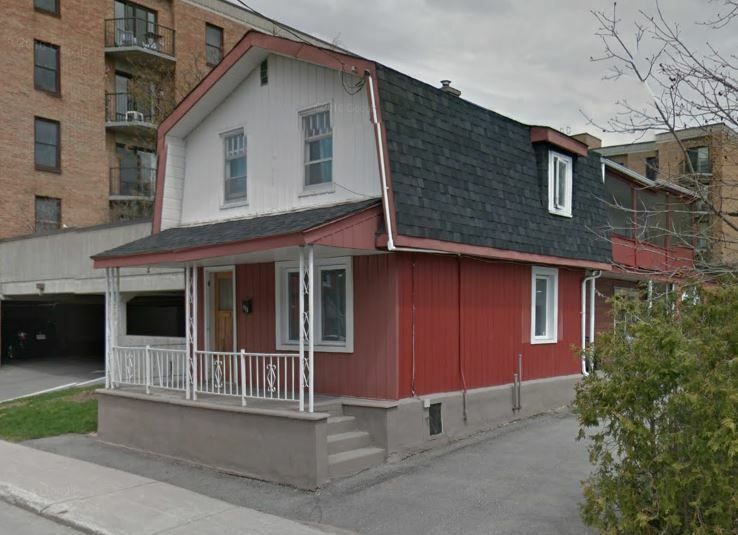 The ice house on the west side of the street did not belong to Artelle, it belonged to Napoleon Dore, his competitor, who had gone into the ice, wood and coal dealer business in the area in 1914. Unfortunately, I cannot locate any photos of any of these original ice houses. 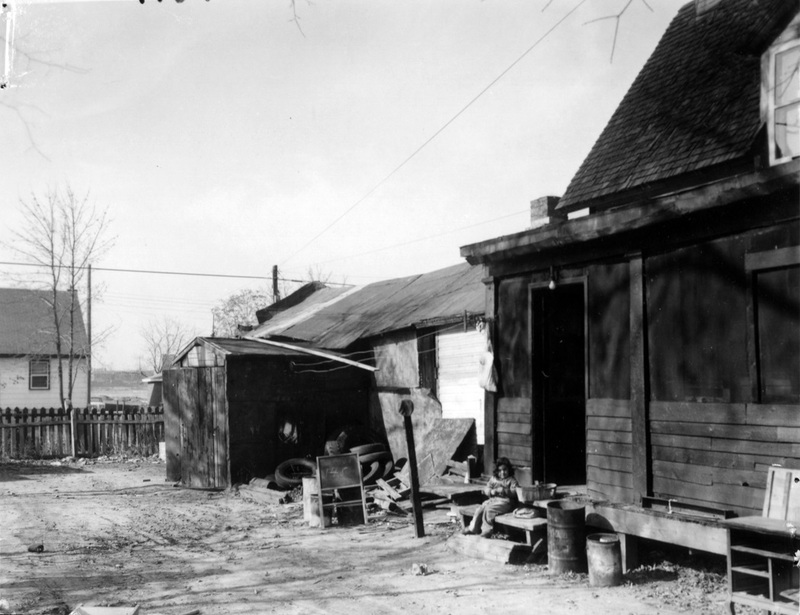 The ice house on the west side of the street, and the upper right house on the east side both survived into the early 1950s. Here is a fire insurance plan illustration of the ice houses, to demonstrate their incredible size. For comparison, the houses at 194, 189 and 191 can be seen as yellow rectangles, while the ice houses are shown as large grey boxes. of 3 storeys in height. 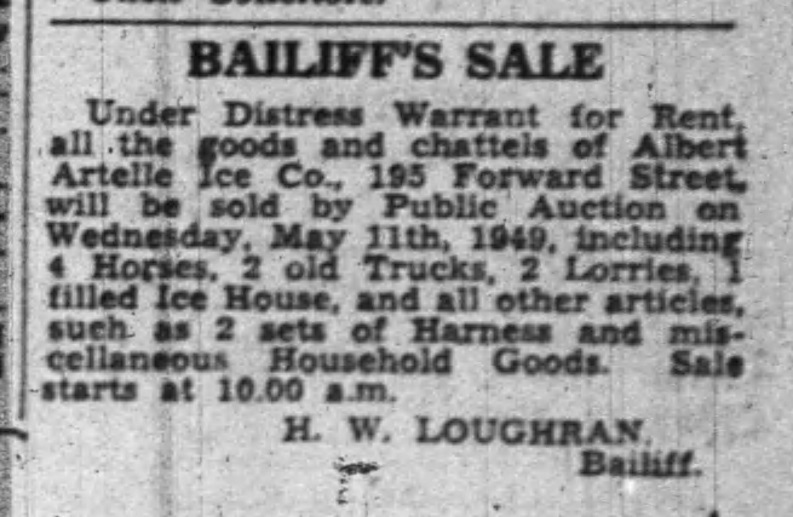 An ad for Artelle Ice from June 11, 1924. 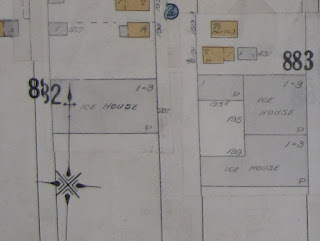 In the 1930s, or possibly early 1940s, new and more modern ice houses were built on the east side, closer to Scott Street. One such ice house is captured in a photo below from 1956, when it had become the property of the Tobin-Everedy Company. The concept of a business of ice selling would be completely foreign to most in 2016. Here is generally how it would have worked: Harvesting of ice at the Ottawa River would occur when winter reached its coldest point, and might go on for two months or more, depending on the length of the winter. The ice was required to be at a depth of at least 18 inches, but ideally it would reach 24 or more. Work would often be done at night as well, when the ice was at its thickest. Large teams of men would be hired to harvest from a particular area of the Ottawa River. A large area would be plotted out, marked, and then scraped clear of all snow. An ice plow would then be pulled over the ice with its eight teeth marking the ice to identify where the cuts would be required to divide the ice into individual "cakes". In the early days, an ice saw would be used to cut. The ice saw featured a four-foot blade with a curved metal neck and a wooden crossbar handle. Later on, gasoline powered circular saws could be used. The cakes were then pushed along the ice to the shore, with the cold air drying them quickly. A two-horse sled was loaded and then would be pulled up through the streets of Mechanicsville to the storage sheds or ice houses. Once at the ice houses, oak planks would be laid out to pull the ice up on, so as to stack them. Each layer would receive a sprinkling of sawdust so that the cakes would later separate easily. Around the edges, a foot of tamped sawdust would insulate the stack, and there it would sit until the summer or hopefully all the way until the fall, sold by the ice dealers and delivered to homes directly to the ice box (the early version of the refrigerator). The colder and longer the previous winter was, the cheaper the ice would be that summer. A short, warm winter might mean a critical ice shortage. It was estimated that waste through melting, spoiling, etc. in the early days of ice making was at the 90% level, but by the 1900s, would be only at 20-50%, depending on the efficiency of the company and its workers. 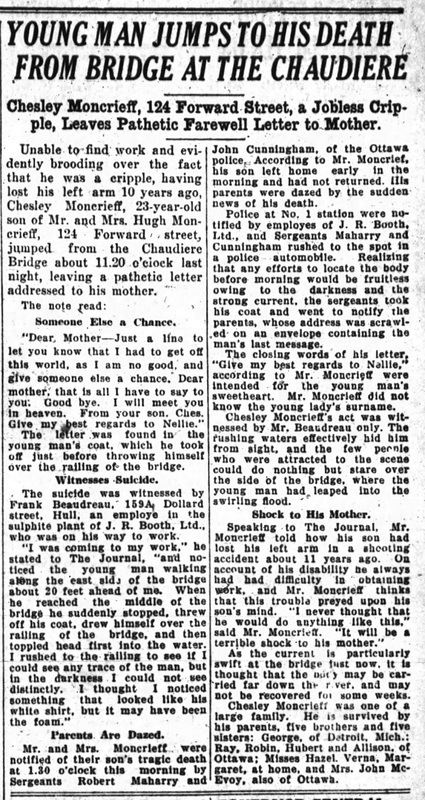 With water contamination issues a serious issue in Ottawa and particularly the Mechanicsville-Hintonburg area in 1910-1913, it was announced in 1913 that ice cutting was no longer allowed below the CPR bridge. Nepean Bay had been a popular ice cutting spot, but due to the contamination from Cave Creek and other sources, the cutters had to focus on the areas west of the bridge, particularly in Lazy Bay at the end of Stonehurst (remember that the River used to come right up to Burnside Avenue, before the area was filled in a bit for the Parkway in the 1960s). Ice dealing was a keystone business in the Mechanicsville area. Other families in this business during its peak in the 1920s included Dore, Hobbs, Lacroix, Ring & Paterson, Vaillancourt and of course the Vachons. The ice-making business suffered through the 1930s due to the economic depression, in that ice became a luxury for many. It was dealt a death-blow after WWII when modern refrigerators with cheaply-produced electric motors became commonly available, along with the growing popularity of manufactured ice. 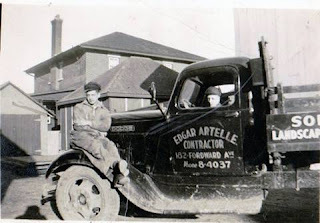 It is no surprise then that in 1949, the Artelle Ice Company went out of business, selling off its remaining assets. It certainly is impressive that they had survived as long as they did. 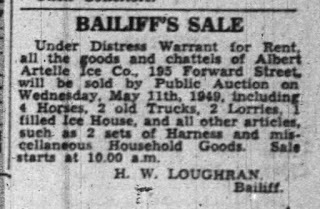 A couple of the sons did continue to work in the ice business in the 1950s. Michael Artelle operated Superior Ice out of 174 Forward into the mid-50s, while Edward Artelle was dealing ice from sheds at his home at 32 Lowrey Street. Meanwhile, Dore Ice took over the Artelle ice houses from 1949 until about 1952 when they too went out of business. 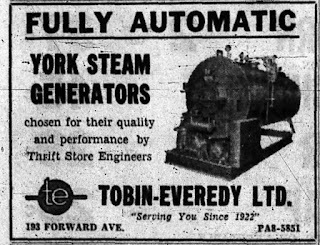 In the summer of 1954, Tobin-Everedy Ltd. moved its offices and warehouses to 193 Forward, into the former ice houses. (More on Tobin-Everedy below). 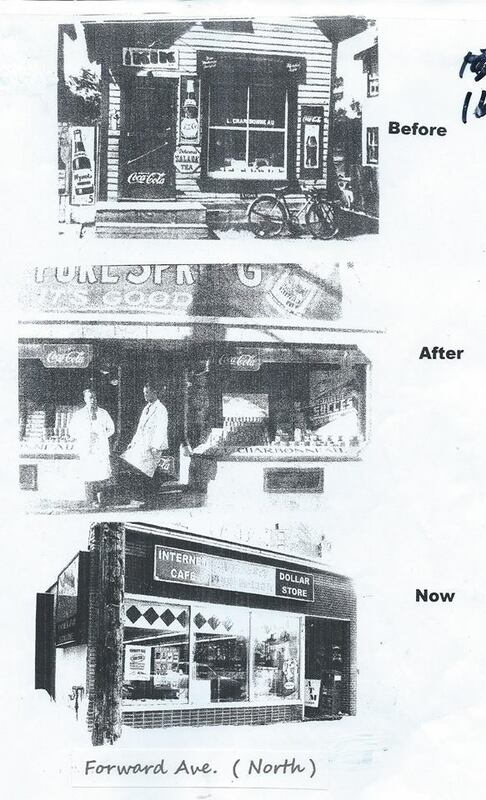 Lucien Charbonneau opened a grocery store and butchers shop on Forward Avenue before 1939, first at 82 Forward by 1940, then after 86 was constructed between 1945-1946, he moved there. By 1955, it was operated by Lucien Sigouin; by 1963 it was an Excell Food Market; and by the mid-1970s it was Dube's Provibec, operated by Denis Dube. 86 Forward still stands today, one of the final old structures still standing north of Burnside. 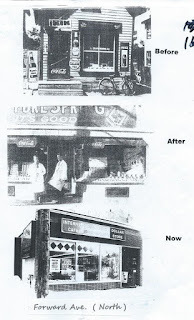 Below are two old photos of the Charbonneau store posted by Conrad Charbonneau last year. I imagine the top photo is the store at 82 Forward, and the middle photo is after he moved to 86 Forward. The Larcoques converted their home at 71 Forward in to a business during the difficult years of the depression and into WWII. In the early 1930s, Frank Larocque operated a grocery store, and by 1948, 71 was listed as a restaurant operated by Mrs. Aurore Larcoque. A few years later, it became "Perier Confectionery" operated by Noel and Colombe Perier. 160 Forward was "Edna's Place" confectionery in 1948, operated by Edna Vanasse. It operated only briefly. 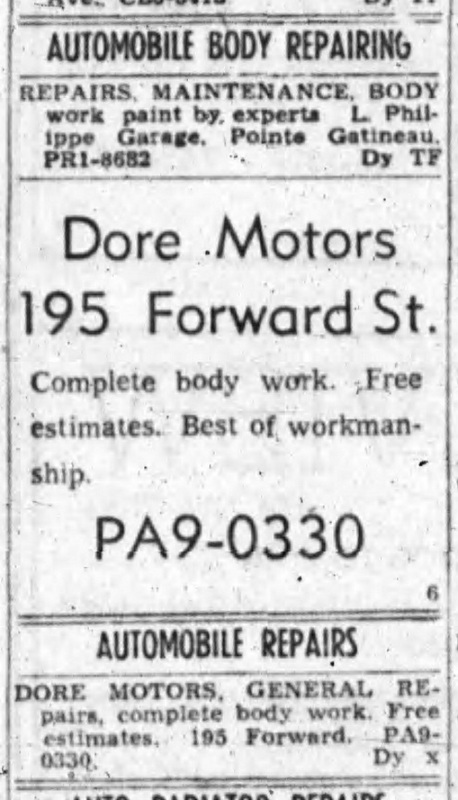 After the closure of the Artelle Ice, the south end of Forward became a bit of an industrial and commercial area, with a variety of businesses: American News moved to 202 (more on that below); the Lucille Beauty Salon operated at 191; Gordie's Hydraulic Service at 191 1/2; Tobin-Everedy Ltd. at 193; Dore Motors at 195; Ray Neon Sign at 205; and Saunders Auto at 212. The American News Company Ltd., wholesale distributor of magazines, also moved to this area around this time, from their previous location on York Street. They established a new commercial building at 202 Forward. 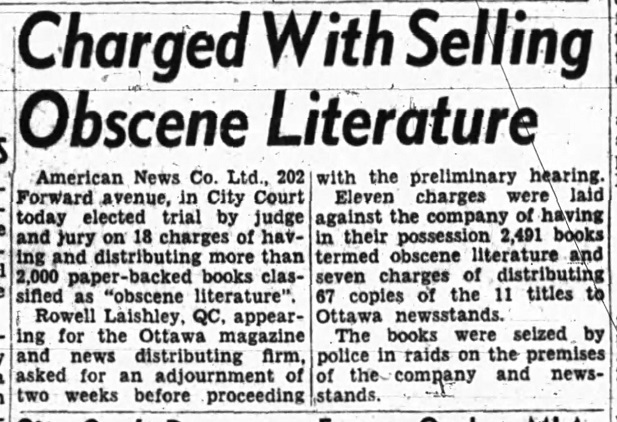 In June of 1955, the Company was raided by Ottawa Police, and charged with distributing "obscene literature" in the form of paper-backed books. 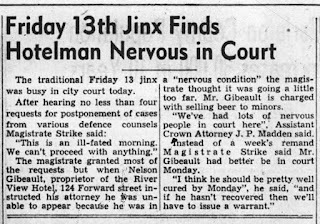 This came a month after a break-in at the shop, where safecrackers broke in and blew off a six-inch thick door to a heavy office safe, only to find the safe contained just eight dollars and stamps. 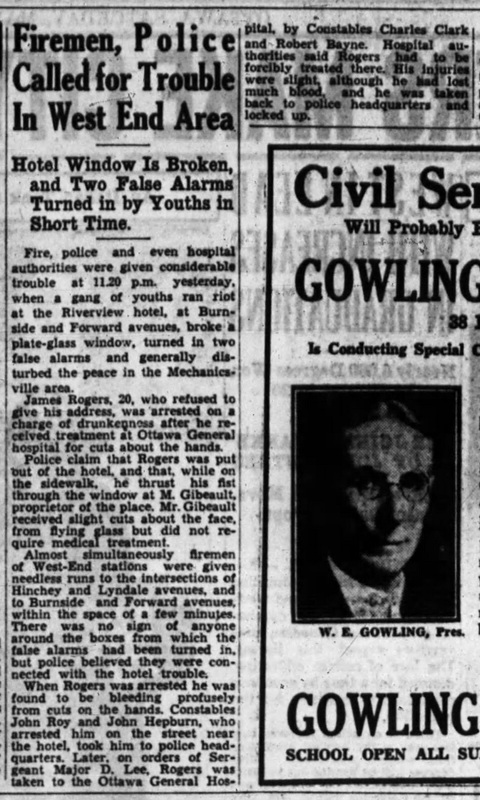 The paper added "The explosion was heard by residents of Forward Avenue, but they paid little attention to it and did not inform police." This building later became Henderson's Furniture in the 1970s. 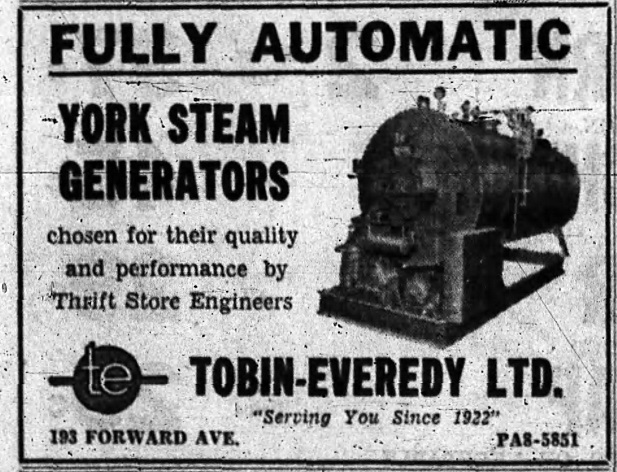 Gordie's Hydraulic briefly operated out of an add-on to the Artelle ice house at 191 1/2 Forward, but the garage was soon after taken over by Tobin-Everedy. 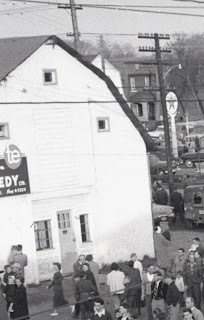 Tobin-Everedy had been located on Edison in Westboro, before opening in their expanded location at 193 Forward (in the old converted Artelle ice houses) in June of 1954. CPR tracks are along the bottom, and Parkdale along the left. on the west side, while new warehouses are on the east side. the right, Parkdale at the bottom. The first event of note on Forward Avenue was the construction of the old Mechanicsville Separate School, which opened in 1886 on the east side of the street. The land (four lots - 7, 8, 9 and 10 on the east side of Forward) was acquired by the Catholic Church on December 21st, 1885, and a mortgage taken out in January 1886 towards its construction. F.X. Sauve was one of the key officials representing the Roman Catholic Episcopal Corporation in its establishment. It was located at 159 Forward Avenue, and was fairly small in size. It was constructed 2 storeys high, in brick, fronting Forward about 50 feet in width, and 30 feet in depth. It was located in the center of a three lot block 150 feet wide, with large schoolyards on both sides of the school (a small 1-storey brick addition was added at the back during the 1920s). 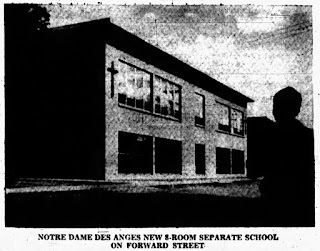 The school soon after became known as St. Antoine de Padoue, and was operated by the Grey Nuns. 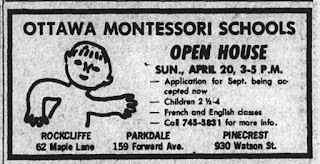 Unfortunately I have found no photo of this old school to date. 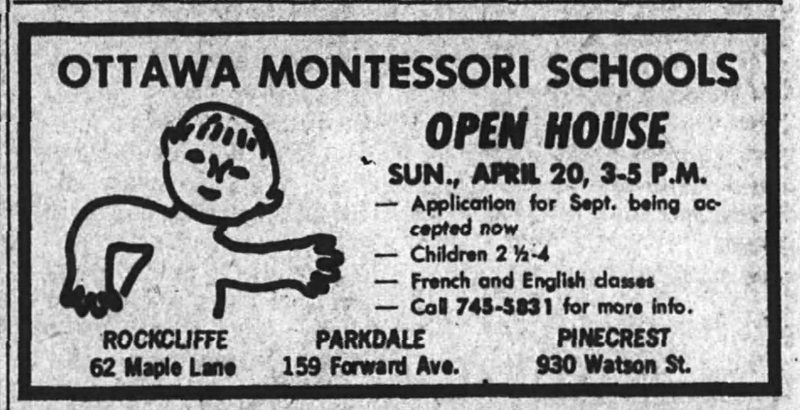 In 1955, the Ottawa separate school board invested significantly in new school construction, and added five new schools during the year, including a replacement for the old Mechanicsville Separate School. 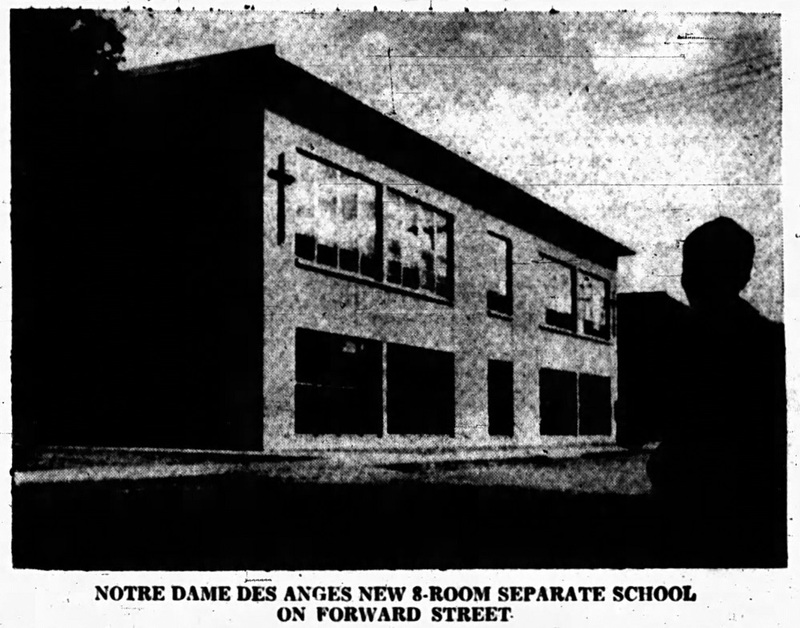 The old school was demolished, and the new Notre Dame des Anges was completed in time for the start of the 1955-56 school year. the Notre Dame des Anges school in the middle. 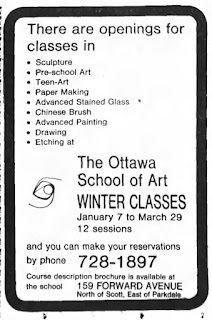 The building later operated as a Montessori School in the mid-1970s, and the Ottawa School of Art from about 1978 until late summer 1983. Ironically it was exactly 100 years after becoming Catholic property that the Separate Board sold it. 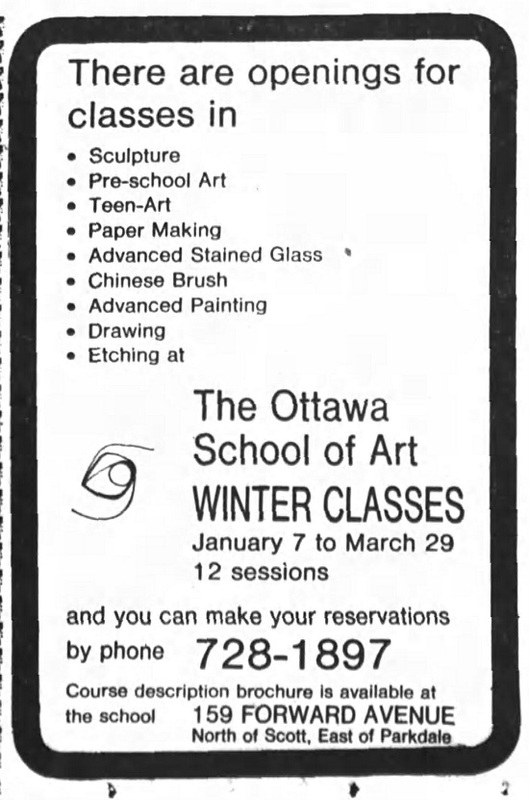 The Regional Municipality of Ottawa Carleton purchased the building for $381,000 in February of 1985. Moffatt Construction handled the job of converting the school into housing units. The job was completed by the end of August 1985, and the RMOC operated the building as 17 emergency shelter units for homeless families (women and children fleeing family violence, victims of fires and floods, those evicted from their homes, or newcomers to Canada with nowhere else to go). In 1990, the building was expanded with the addition of a third floor, allowing for 25 units total, which resulted in the closure of the underutilized Waller Street shelter. This shelter continues to operate today, with more a focus on women and immigrants/refugees. 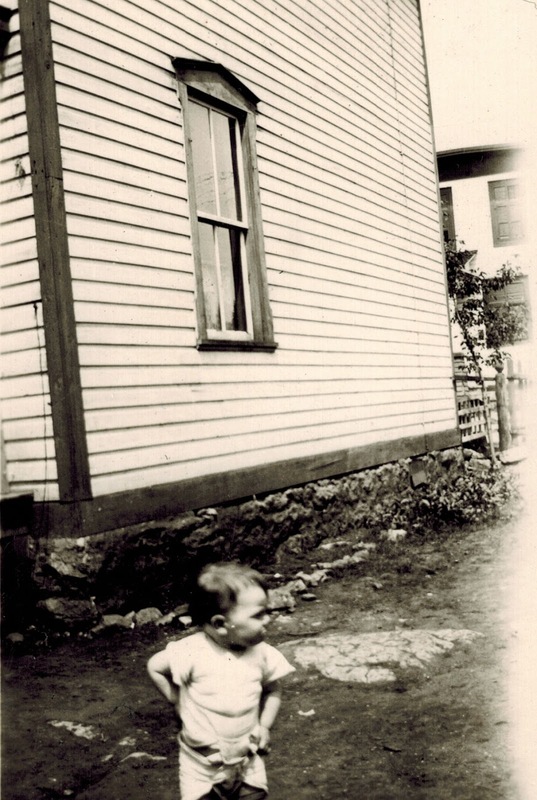 Smallpox hit Mechanicsville, and especially Forward Avenue in the fall of 1901, when two children of the Cusson family and three children of the Saumur family came down with smallpox. 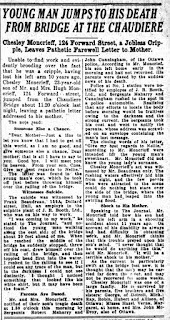 At the same time, a child of Francis Meunier of Hinchey Avenue died from it, while there were many other cases throughout the village. The smallpox outbreak was significant in 1901 in greater Ottawa, and patients were treated at the isolation "hospital" on Porter's Island, which was a small wood shack and a series of outdoor tents. One of Mechanicsville's earliest residents was Hyacinthe Latreille, who operated a grocery shop and small hotel and tavern on Hinchey Avenue in the 1890s at the north end when Hinchey used to extend to Emmerson. The family later moved on to Forward around 1901, and there the Latreilles would remain for nearly 100 years, into the 1980s. The first house to be bricked was Alexander Dennault's house at 160 Forward Avenue, which was built between 1899-1901, and bricked upon completion. This house had survived until the 1990s. Dennault was a yard master for the CPR (he also had owned for many years the duplex house next store at 154-156 which he had acquired from James Newton in 1886). 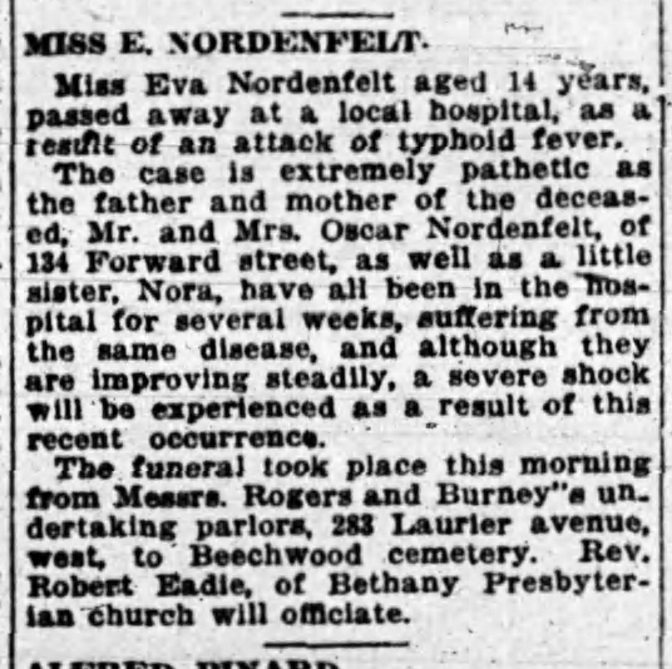 The typhoid problems of Ottawa, but particularly the neighbourhood, of the pre-WWI era are well documented (here is a bit I wrote on Cave Creek last year: https://kitchissippi.com/2016/03/30/cave-creek-ottawa/), and in December of 1913, the Nordenfelt family was significantly affected. The father Oscar was an immigrant from Sweden, the couple marrying in 1897 and having recently moved to Mechanicsville from Dundas, Ontario. 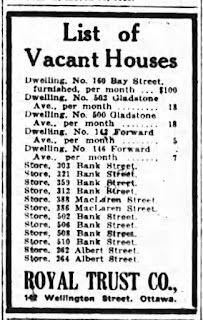 The advertisement below from 1918 lists two houses on Forward Avenue for rent. 142 Forward could be rented for $5 per month, while 116 Forward could be had for $7 per month! The last block of Forward Avenue to have concrete sidewalks installed was the southern block, from the CPR tracks to Lyndale. These sidewalks were included in the city's local improvements work orders in late 1923 or early 1924. 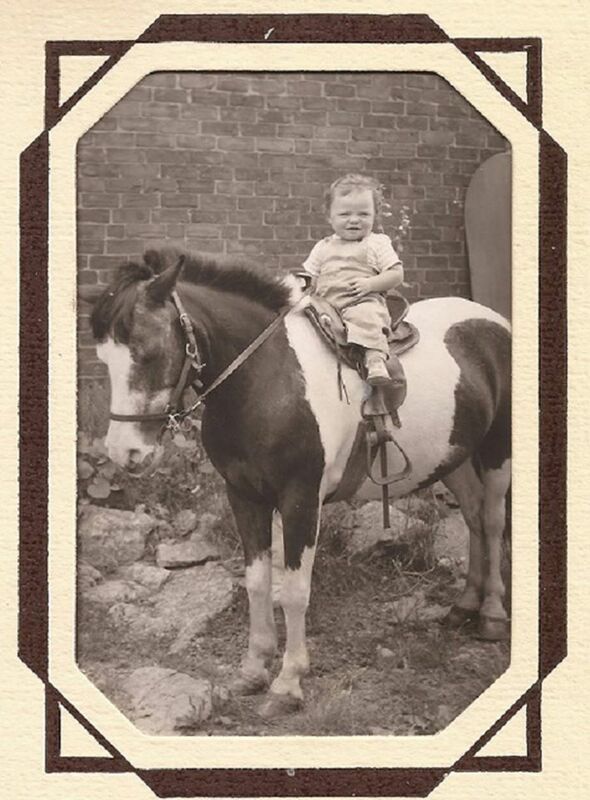 Into the 1930s, it was still common for Mechanicsville residents to keep animals on their property. The photo below was taken at 93 Forward Avenue in approx. 1928. Ronald Blais at 93 Forward, circa 1928. From the late 1800s until as late as December of 1970, fire alarm boxes were a feature of all neighbourhoods in Ottawa. They originally were required in the days before telephones were commonplace in all homes. A person would open a small door, pull a lever and then turn a knob or pull a hook. A spring-loaded wheel would then activate, tapping out a pulsed electrical signal corresponding to the box's number to the fire department headquarters, who would then send out wagons to that box. One of Mechanicsville's two fire boxes was located at the south-west corner of Forward and Burnside (just outside of the River View Hotel). 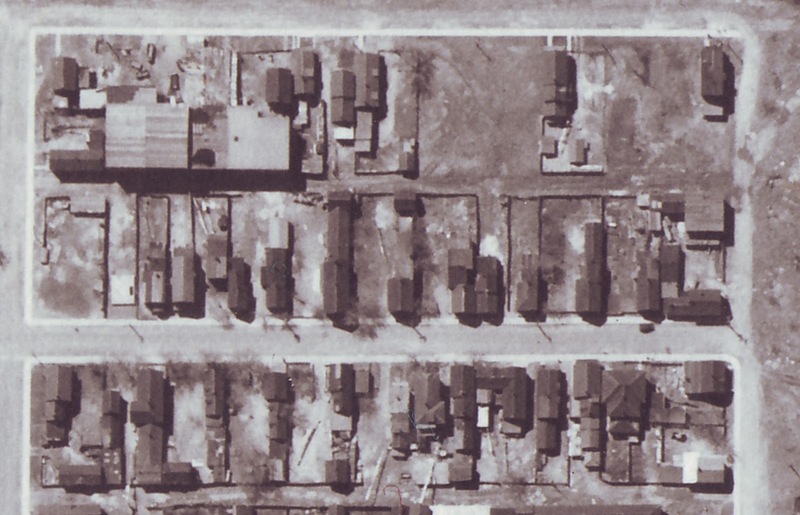 Below is an early, clear aerial photograph of Forward Avenue from 1933. showing the north end of the street. Parkdale Avenue is at the top, with Emmerson at right and Burnside at the left. Only two houses from this entire photo still exist today (82 and 84 Forward). Fires were an issue for all of Mechanicsville. There was about one per month throughout the 1800s and first half of the 1900s. 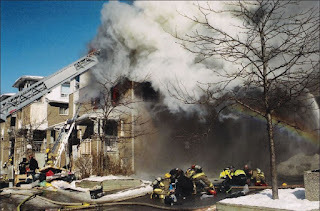 Numerous reports through the years show Forward Avenue had its share of house fires, understandable due to the wood construction of houses, the poor quality of the build, the shoddy electrical installations, wood fireplaces, heating pipes, etc, The close clustering of the houses could turn a small house fire into a burning block. Forward had many fires over the years, but one notable one with sad fatalities. 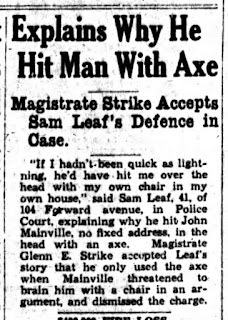 In the early hours of May 2nd, 1938, a fire struck the home of Nelson Lacasse, former alderman of Elmdale ward, at 71 Lyndale, at the north-east corner of Forward. Sadly, two of his grandchildren, Jeannine Lacasse (aged two years) and Alice (three months) died in the fire. Overheated stove pipes were given as the cause of the fire, which broke out in the bedroom above the kitchen, where Nelson's son Rene and the two children were sleeping. By the time Rene work up, the room was engulfed in flames, and he was unable to reach his daughters. Both he and his father suffered serious burns attempting to reach the children, as did three firefighters as well. Rene's mother and three sisters survived the fire, as did a 17-year old brother who had left for work earlier. Rene Lacasse had lost his job six months earlier and the family had been forced to move in to his father's home. Making the story even more sad, Rene's wife Lucille was in the hospital at the time of the fire, in critical condition owing to a serious illness from which she was not expected to survive. She had major surgery scheduled the day of the fire. To the surprise of many, Lucille's condition improved, to the point where she was able to go home a week later. The family was not able to tell her of the death of her two children for several days, and she missed the tragic funeral held the day after the fire at St. Francois D'Assise Church. As was the case with most fires, even though the home was heavily damaged by the fire, the interior was rebuilt, and the home still stands today. The fire led to the City conducting stricter inspections of stove-heated homes, to ensure the pipes were protected, and located a safe distance from the walls. The Fire Chief noted in the Lacasse fire that the pipes passed closely to the wood partition, which was also coated with several layers of wallpaper, loose in parts, which contributed to the rapid spread of the fire. Others noted as having participated in the war were Sgt. A.J.M. Landry of 167 Forward, Cpl. G R. Jodoin of 2 Forward, CSM H.F. Sullivan of 128 Forward, Pte. H. O'Connor of 1 Forward, Pte. J. O. Bourguignon of 106 Forward, Sgt. R. E. Auger of 179 Forward, Pte. H. D. Stewart of 82 1/2 Forward, L. Cpl. W. Lepage of 100 Forward, and L. Cpl. R. D. M. Donovan of 114 1/2 Forward. And this list is probably not even complete. 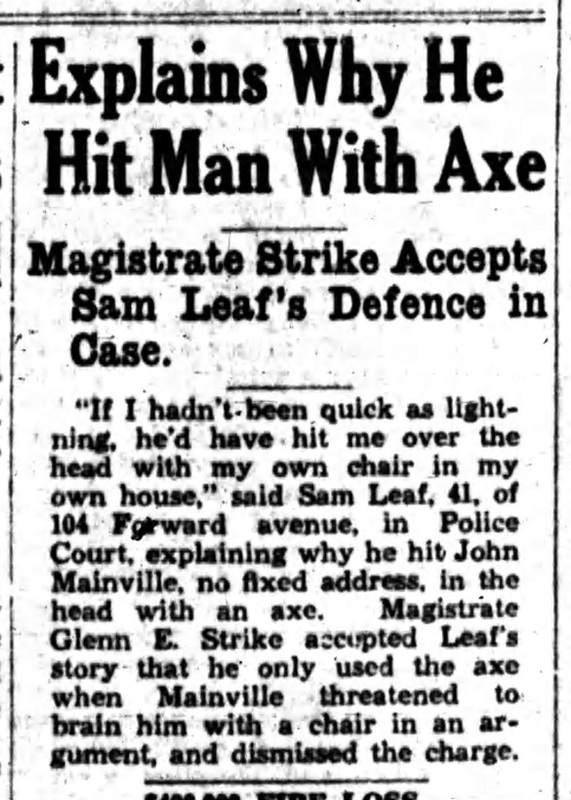 On Canada Day, 1946, Reginald Gourgon, 36, of 125 Parkdale Avenue was killed at the corner of Burnside and Forward when he grabbed a live electrical wire which had been brought down by the branch of a tree which had broken off during a major 70-mile-an-hour storm that hit Ottawa. Gourgon had been walking along Forward after the worst of the storm, and noticed the wire on the sidewalk. 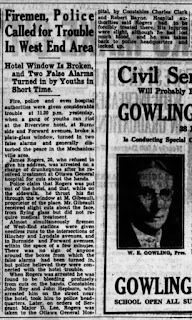 Though a large group of men were close-by keeping children from approaching the wire, Gourgon suddenly attempted to move it off the sidewalk onto the road, and the wire, containing 2,200 volts instantly electrocuted him. He fell to the ground, his right hand still holding the wire. Albert Aspeck of 128 Forward forced the wire from his hand with a large rock. The fire alarm box located right next to the incident was pulled, and three stations replied immediately, but of course, nothing could be done for Gourgon. 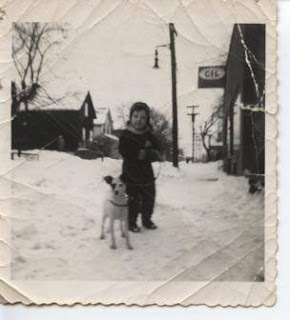 The photo below is taken on Forward Avenue in 1952, though I can't quite tell where exactly it was taken. 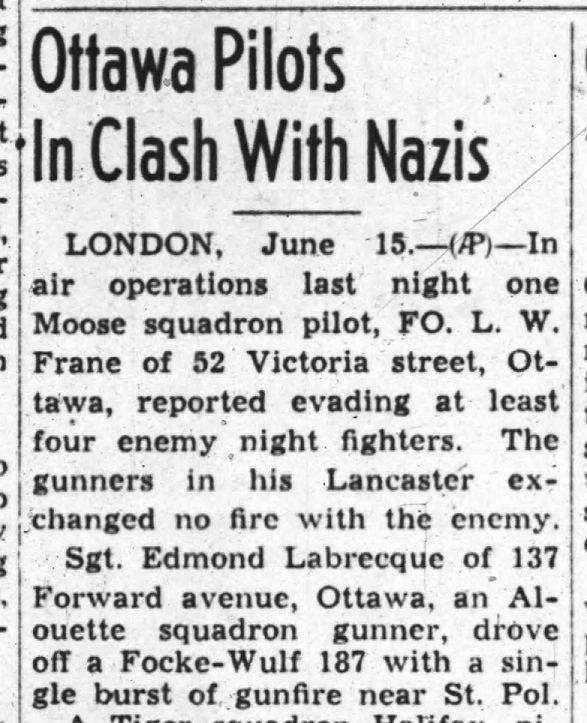 On June 29th, 1953, a fire hit 160 and 162 Forward Avenue, luckily with no injuries or fatalities, despite the enormous number of people occupying the two houses at the time! 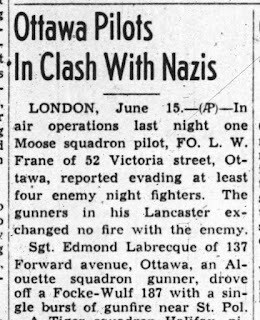 Defective wiring was given as the cause of the fire which broke out at the back of the two-storey home at 160 owned by Andrew J. Findlay, which tore through the wooden sheds at the back, and then jumped the laneway and gutted 162 Forward, owned by Alfred Tremblay. Mrs. Findlay was having dinner at 160 with her brother and her four children when the tenant who lived upstairs at 160 shouted down about the fire. 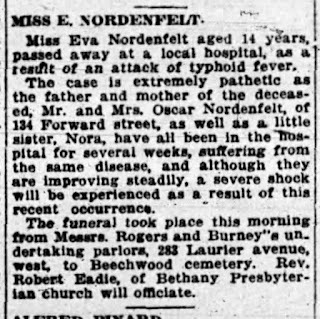 Mrs. Findlay also had five infants in the downstairs bedroom (home daycare) and rescued them out two at a time, handing them to neighbours. Meanwhile, Mr. Tremblay and his wife and six children all escaped uninjured as well. 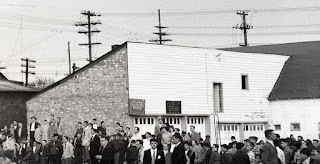 A major fire hit Forward Avenue on Sunday May 20th, 1956, when children playing with firecrackers burned down one of the old ice houses/warehouses at the south end of Forward, and caused damage to 18 houses on Forward and Hinchey. It was a blaze that actually threatened Mechanicsville as a whole. 191 Forward was fully lost to the fire. (I'll be covering this fire as an article of its own in an upcoming blog post soon). In early 1963, some area residents were pushing for Forward Avenue to be opened up over the CPR tracks, as it was known that the end of rail traffic was coming (it had already been announced that passenger trains would be removed soon). But the Board of Control refused their request. Mayor Charlotte Whitton commented that it would cost $16,000 to create the access over the tracks. On top of that, there was still freight traffic planned to continue, which it did well into the 1970s. Had council agreed to establish the opening in 1963, it likely would be open at Scott Street today! west, with Parkdale at the top. The long-time Chenier family home, at 194 Forward, circa 1956. Construction on the Ottawa River Parkway east of Parkdale began in May of 1966, and was completed in time for the opening in July of 1967. The Parkway severed Forward Avenue's direct access to the Ottawa River, and as mentioned above, was the cause of significant expropriation at the north end of the street. In 1971, a storm sewer outlet was contracted for an outlet from Forward at Emmerson, out to the Ottawa River, 461 linear feet of 84 inch diameter tunnel. This was called the "Hintonburg Central Outlet". destruction and garbage that had occurred. From 1973 onwards, there were two types of history happening on Forward Avenue. One was the demolition of houses and construction of new buildings. I don't have the exact dates/details of all the buildings that were built on the street unfortunately, and it would not be too easy to research. 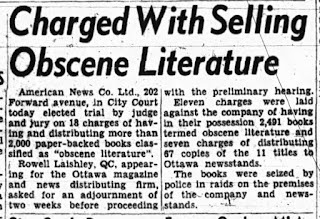 The second type of history were stories of crime. 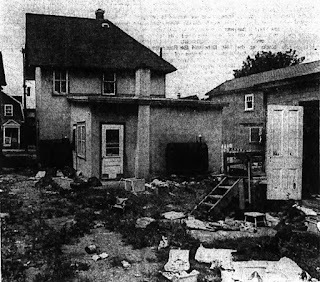 Mechanicsville in the 70s and 80s went through probably its darkest period, and there were many stories of break-ins, thefts and even murder on the street. Not too much positive or all that interesting to report on, I'm afraid. 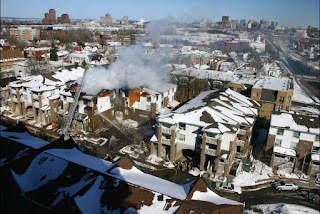 The five-alarm blaze injured six fireman, three seriously, who had to jump from the third storey when the smoke and heat became overpowering while searching for trapped residents. The firemen survived thankfully, but 14 public housing units were destroyed, leaving 35 homeless, and causing an estimated $500,000 in damages. The fire exposed some major issues within Ottawa Fire Services, and led to significant changes to how Ottawa firefighters responded to fires. 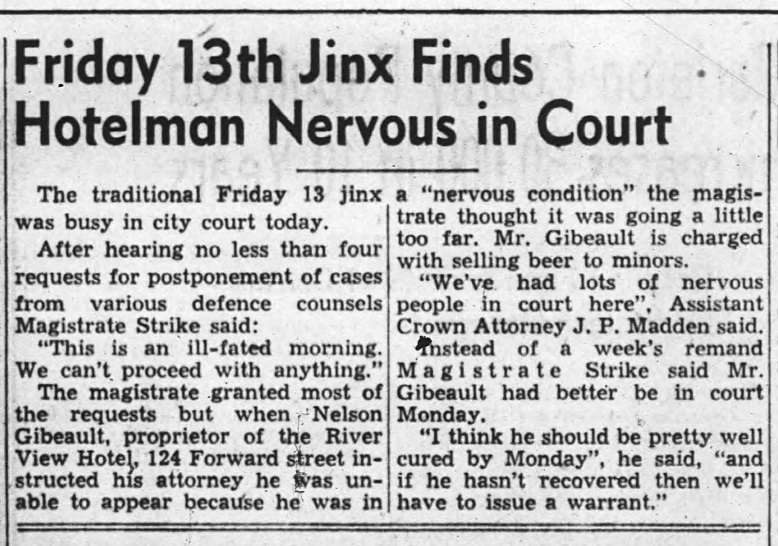 As the Citizen reported: "Much went wrong that day. Communications systems broke down. Critical transmissions were missed. Equipment malfunctioned or was mishandled. The system designed to account for the whereabouts of firefighters failed. And in the heat of rapidly unfolding events, some firefighters lost "situational awareness": the ability to make informed, rapid decisions." A 100-page report was produced of the near-tragedy, and changes to the OFS included all firefighters equipped with a portable radio, a new strategies and tactics manual, new search methodology, new ladders, fire dynamics program re-developed to teach firefighters more about the science of a fire, new thermal imaging cameras, and new self-contained breathing units, among other changes. Meanwhile Place Allard (which was named for Joseph D. Allard, long-time Alderman and Wellington Street merchant in honour of his life-long dedication to the residents of Mechanicsville and Hintonburg) was rebuilt, and had an opening celebration just this past June. So there you have it, the exhaustive, but by no means complete history of Forward Avenue. So many stories and happenings over its 144 years of existence, I hope you found some of these highlights interesting to read! It's too bad Forward Avenue really has lost so many of its original houses, but at least the stories and memories will never be lost!